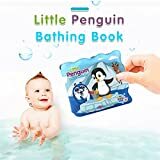 Ecurson♥Floating Kids Books for Bathtub,Little Penguin. Waterproof Educational Toy for Baby or Toddler. Bath Time Learn & Play.